I reviewed this bike sometime ago, and it is now for sale. If interested please contact me. I have had the good fortune to test ride this gorgeous bike for a few days, and, like all things Italian, it is blessed with wonderfully good looks and style. It was purchased by my daughter recently, second hand, but in almost new condition and apart from a couple of paint chips it looks like new. 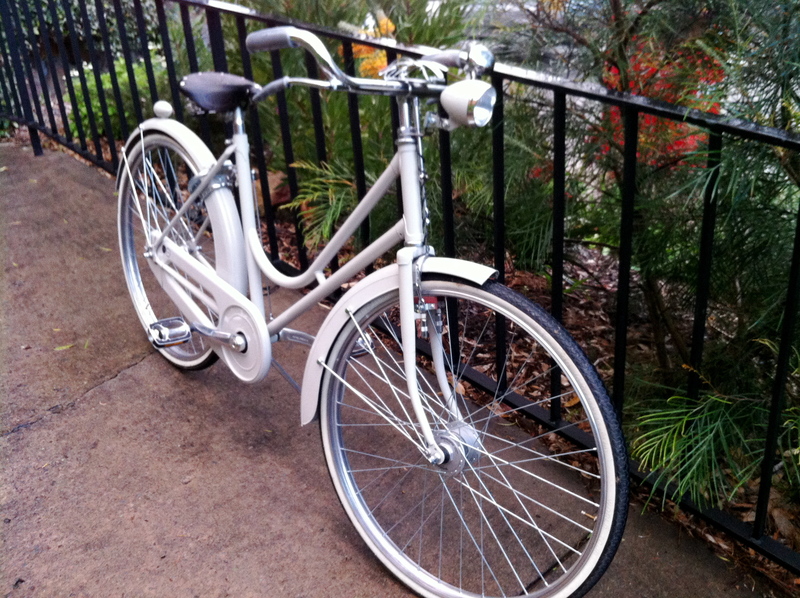 Abici is a relatively new company, having been formed in 2006, but dedicating itself to making classically styled bikes. The pale grey colour is understated and classy, blending well with the white wall tyres, and the frame is free of any decals except for the two round understated black ones you can see on the chain guard – Abici’s trademark cross and name. The Italian loopframe offers all of the benefits of a low step through with a distinctive classic look. 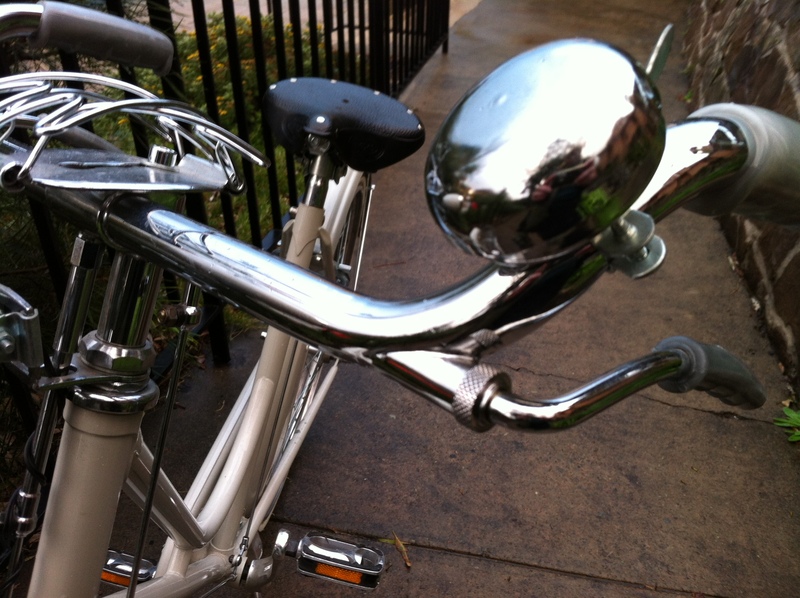 Riding this bike is an experience, it is an easy ride, the single speed and easily manipulated brake levers add to the ease of the ride … note how the brake levers are so beautifully integrated into the handlebars and their positioning directly beneath the handgrips makes them perfectly intuitive to use. 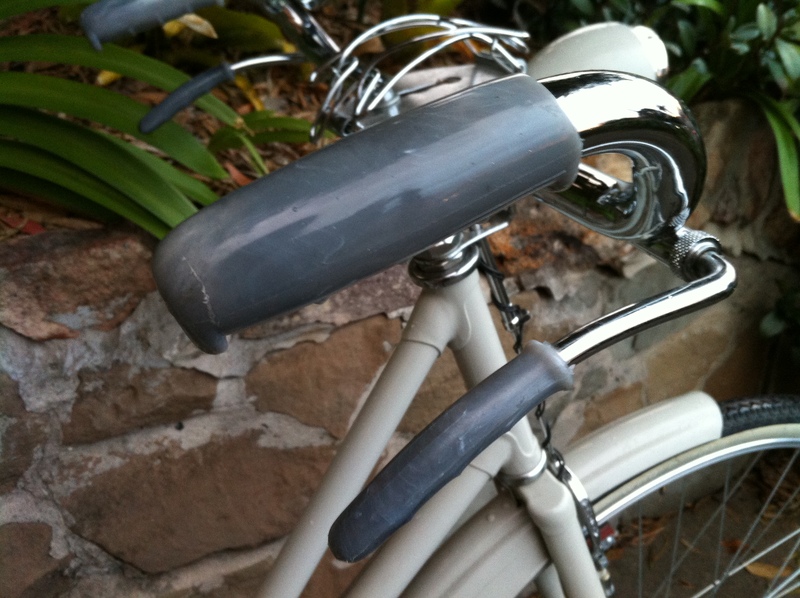 The handgrips and brake lever grips are made from a hard, grey marble-look plastic which looks great with the rest of the bike but is a little hard to the touch when compared to most handgrip materials. The lighting is state of the art in appearance, with the headlight being dynamo hub powered and the rear light being battery powered. Perhaps the rear light needs to be a tad brighter. 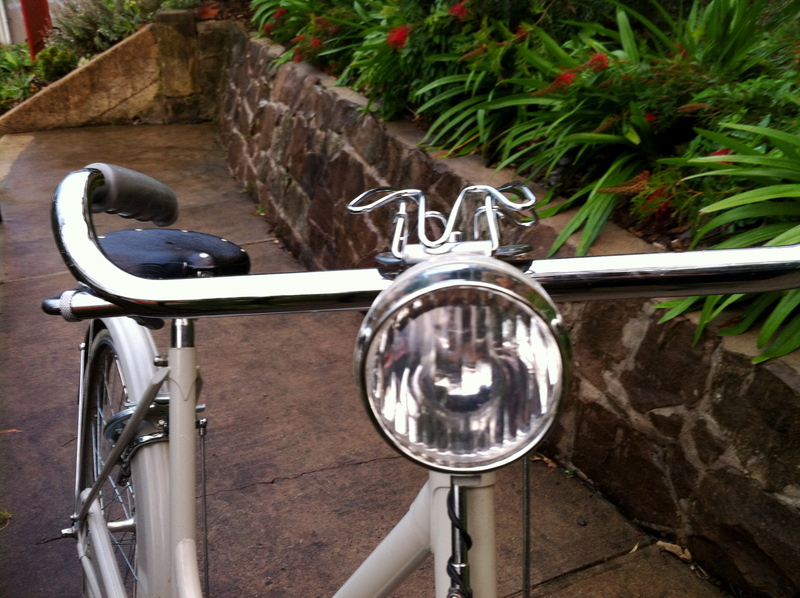 The chromed rod brakes add a sense of neatness and style that is not possible with cables, a feature I like. The flat pedals are neat, sturdy, stylish and functional. Riding the Abici I found to be a special experience, looking at the lustrous and straight chromed handlebars gives it a luxurious touch and it handles quite differently from other bikes I have ridden, it wants to go in a straight line and to stay very upright and thus feels very stable, though I did not have any trouble with cornering. When I was riding it I was running late so was rushing and, not having extra gears to use, was able to stand to get the amount of acceleration I needed. This is something I can also easily do on my Speedwell, but I do not think it would be possible on the Gazelle I rode recently, which was just too upright to allow a standing position. The seating position felt just right in the upper body, my hand position was excellent, but the seat felt as if it could be higher to give more pedal reach, though that would no doubt compromise the upper body positioning somewhat. The black leather Brooks is perfect for it and looks the part too. I found, unexpectedly, that there is no “skirt rideup” which is an added bonus for me, as it is for any women’s city bike, as I mostly wear skirts on the bike and did not need to make any adjustments as I rode along. The brakes work well but when heavily applied they shudder, a flaw that could no doubt be corrected with adjustment, and they work fine. The 26″ wheels are a new thing for me and I was certainly aware of it, I prefer larger diameter wheels, they just feel as if they roll better, though not necessarily faster. It also has a few rattles which I am sure could be adjusted away and perhaps the additions of leather or rubber washers at mounting points for the fenders would help with this. The fully enclosed chainguard and extra wide fenders make for a solid, but not heavy, appearance, and give protection from any sort of bikey stains. 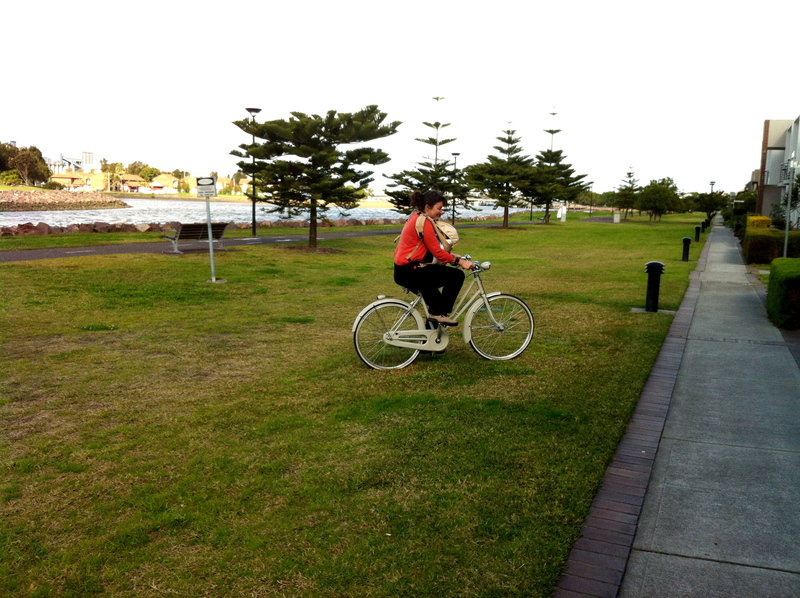 But, I hear you ask, what is the carrying capability of this bike, there are no racks or baskets? 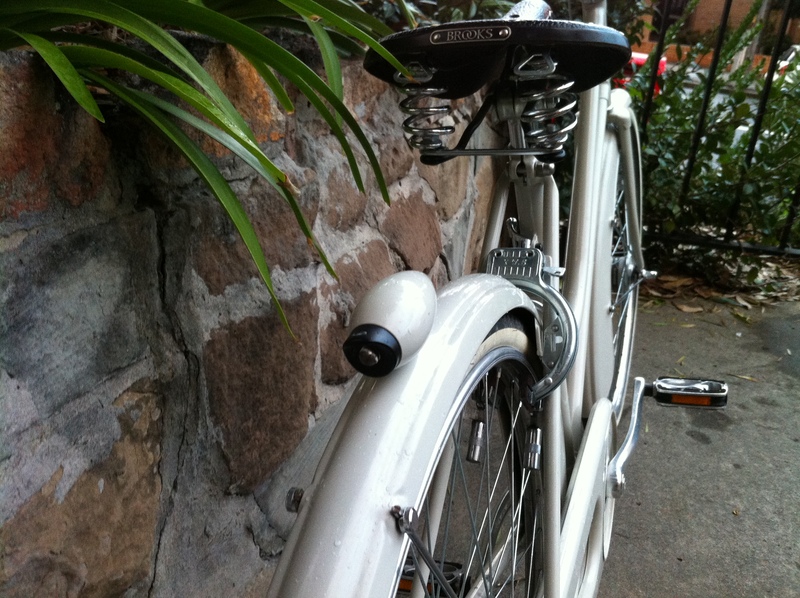 If you look closely at the photos you will see a sprung newspaper rack on the handlebars – a unique and perhaps somewhat useless feature, though it can carry a waterbottle. 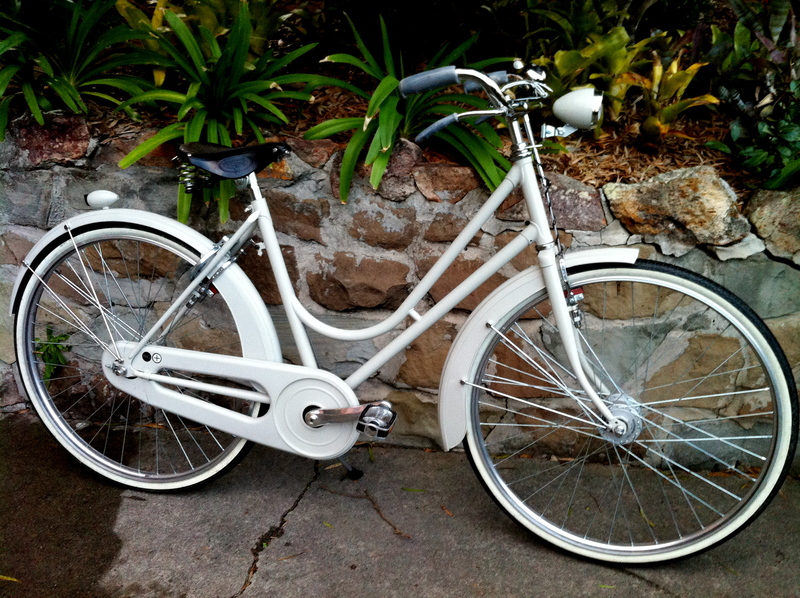 Perhaps this is the bike you need to use with a leather designer handbag slung over your shoulder or from the handlebars so it is shown to full advantage. Contact TED (0411 110 831). Oxford tandem, circa..1946..purchased from retired English couple living in Manildra (NSW) in 1985. Currently restored by self. Unique in that it divides in two pieces by loosening one speed nut..seats & handles fold flat..will fit inside average sedan boot.